Traffic is bad, the job is a drag, prices are rising, wages are stagnant—and on top of all that, a volcano might reduce Planet Earth to a “pre-civilization state,” some scientists claim, adding that such an eruption might be overdue. Researchers at Bristol’s Schools of Earth Sciences and Mathematics in the UK estimated how often the largest explosive “super-eruptions” happen. It turns out, a lot more frequently than previously thought. “Super-eruptions” can eject more than 1,000 gigatons of erupted mass. That amount of debris could blanket an entire continent, and change the planet’s weather for decades, with ash blocking the sun. Plants would die, then animals. Without food most people would die. What would be left would be a Stone-Age level of civilization. Researchers at Bristol University looked at geological data going back through 100,000 years to find signs of super-eruptions. Their findings have overturned current thinking on super-volcano risk. Professor Rougier told The Mirror, “The previous estimate, made in 2004, was that super-eruptions occurred on average every 45 to 714 thousand years, comfortably longer than our civilization. The very earliest discovered signs of permanent human settlements are villages used by mammoth hunters in the Czech Republic town of Dolní Věstonice, dated to about 23,000 B.C. With no sign of a catastrophic eruption since then, one could assume another may be due. Or maybe not. 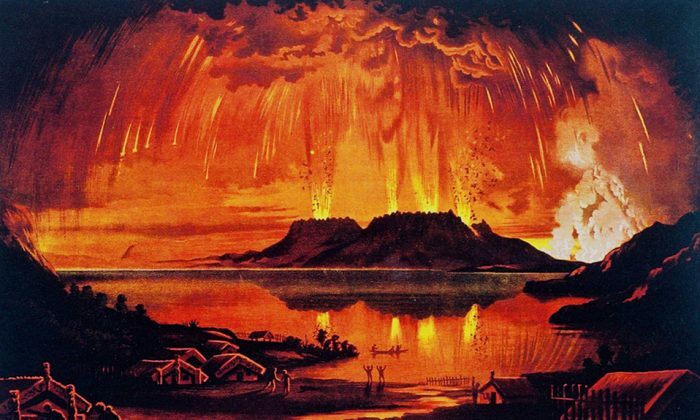 Prof Rougier noted that the last recorded super-eruptions occurred before humanity modernized. “On balance, we have been slightly lucky not to experience any super-eruptions since then,” he said. According to LiveScience, a supervolcanic eruption could have the same impact as a mile-wide asteroid, blocking the sun with ash, reflecting its rays and cooling the Earth—a phenomenon called a “volcanic winter,” similar to a “nuclear winter.” Also possible are tsunamis if the eruption is in or near an ocean, according to the Department of Geosciences at the University of Massachusetts. There are about a dozen supervolcanoes known today, many of them under the ocean. One of the largest encompasses Yellowstone National Park. Professor Rougier pointed out that while supervolcanoes could do devastating destruction, there were many more immediate issues mankind should be addressing. Are you concerned about supervolacanoes? Asteroids? Other Earth-affecting disasters? Why—or why not? Post your comments below. Two volcanoes in North America erupted over the weekend.